One major objective of learning to fly for me is to make a flight to Jersey. Anyway you cut it, this requires flying over the channel and that, even with a newly acquired pilots license and legal – is still not something to be done lightly. So the chance to do it with an instructor the first time, seemed like a sensible approach. 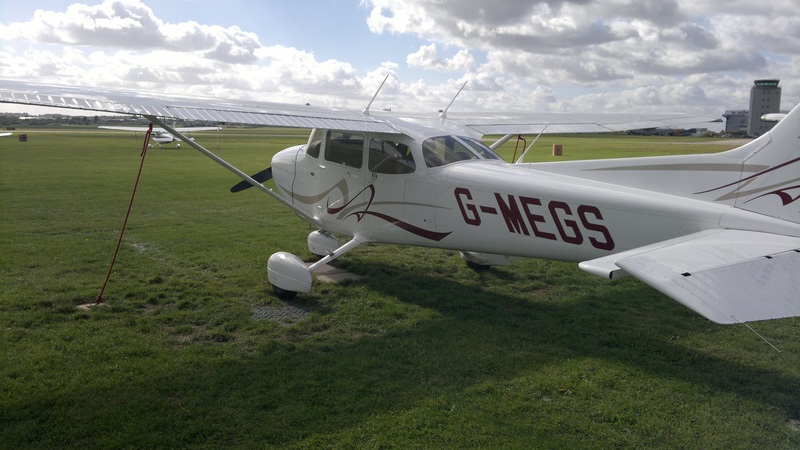 An aero club group day out, we’d take all four Cessna 172’s: One instructor per plane and two pilots – one flying there, the other flying home (great for everyone to get some experience and keep the costs down). 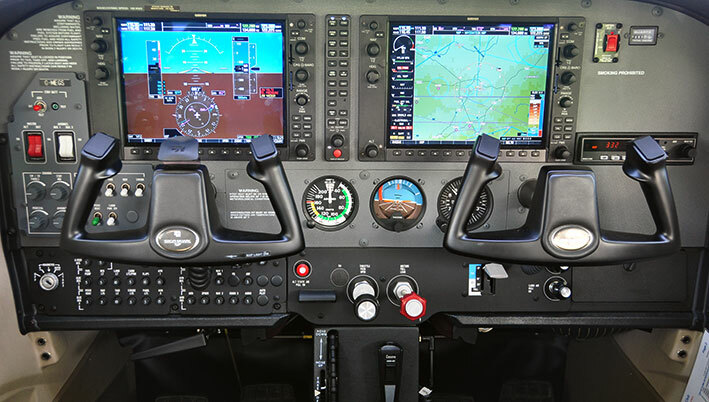 Being differences checked on G-MEGS seemed to pay off again, when the aircraft list was published I got to fly it 🙂 It’s a funny plane, in training its G1000 means you rarely get to fly it and when the opportunity presents itself, you’re reluctant to. Now having my license and having been checked out and had it on solo hire a few times, I do really like flying this plane – it’s very much up there with G-SHWK as a favorite. The forecast the night before was suggesting a dry day, no chance of rain, but cloudy. With everyone arriving around 8:30-9am, the cloud was down around ~2000ft, not ideal for a channel crossing – I had my doubts we’d be going. Within the aero club though it was a hive of activity, those with licenses seemed keen to see the route and plan it up on their charts (I’d dropped in the day before so I already had the route). Those without licenses appeared to be more eager to be involved then I had been on previous attempts for club outings. By around 11am the decision was a trip was on – just not to where. There were now sub-group meetings happening with instructors and the pilots of their respective planes, debates on the weather continued, telephone calls to Le Touquet, Southend-on-Sea, Lydd and Calais. If not, our alternative airfields would be Calais (France), or Lydd (east coast England). I was flying with an instructor I’d never flown with before and a student from the club with ~16 hours experience. On this basis, I was asked if I minded flying the outward leg? No, not at all, this is the way I wanted to do it anyway – another landing at another airfield in the book. My passenger for for the outward leg had disappeared temporarily though, so I grabbed the POH and other airplane paperwork required to be carried for a land away and went to check the plane out. It takes a little longer to checkout MEG’s, more Garmin related switches, bells and whistles but other than that it’s a 172 at heart. Plane checked, route and plog reviewed – just time for a mass pilot briefing to discuss flying in formation and we’d be away. The time was now pressing on for 11:30am. With at least two of the other planes being piloted on the way out by students, it perhaps shouldn’t have been a surprise that irrespective of the more complex checklist, with only one refusal to start it was G-MEGS that had its propeller running first. This wasn’t a race, but it would get our engine temperature up nicely and I personally didn’t want to be last in the formation: It would mean we’d be chocks off-to-on the longest (costing more) and would restrict the options for radio calls etc. G-UFCB would be the lead plane, so we were waiting for them to start and call the tower. We’d agreed they’d do the radio calls for the group, but this pretty much stopped before it had started. G-UFCB called for taxi, a longish pause, then G-HERC called. We better get in then or we’ll be last to get the ok to roll….. Golf Mike Echo Golf Sierra with information Foxtrot, QNH 1023 request taxi. And we were rolling off to holding point Delta, with runway 05 in use today, it’s a long way to taxi and not ideal for an eastern departure but you can’t control the wind. Power checks at Delta kept things interesting, with barely enough room to squeeze in four Cessna’s but we all managed to find a space an point into the wind. G-HERC got cleared to line up on the runway, but their positioning could have been better, so we had to squeeze past them and back track before lining up. Their slipstream was pretty impressive though and you really felt the effect of the propeller spinning clockwise causing the wind to hit us on the left hand side first. No time to spare though, we were soon cleared to go, full power and we were off. At 600ft turning right to head for six mile bottom where we’d set a course for Sudbury, I’d done the route out to there twice in the last month, so was very happy with this. Just pickup the train line, hit six mile bottom then fly east until you hit the industrial town with a railway and river. The lead plane was being flown by a student, I’m told their biggest fear at this stage in their training was the radio – so they picked the short straw today, but the thing to remember is that it’s these new almost forced into experiences, that make you better and more confident in flying. So it’s good to be challenged. Turning over Sudbury for London Southend on Sea, the cloud base was not being very helpful. It was murky and getting 2,500ft was a challenge. 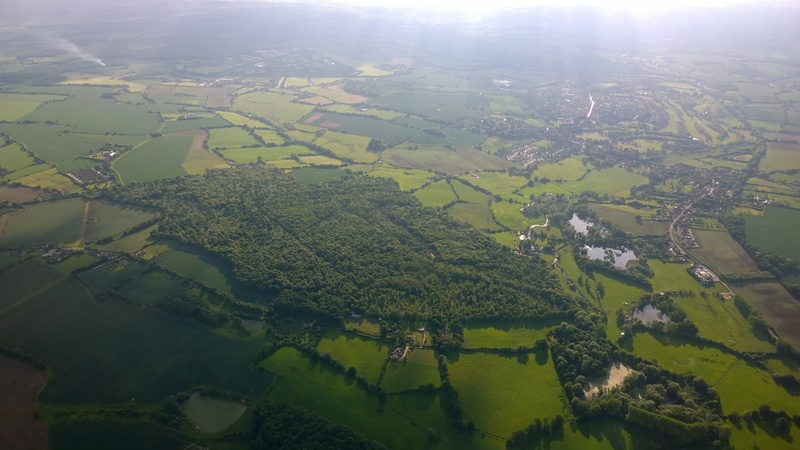 Earls Colne is a bit of a strange airfield, it’s almost literally sat on a golf course and its runway is half asphalt, half grass (and we’re going to have to have a trip out there to try landing on that some point soon!). Passing it on our right though it made for a nice landmark. The weather wasn’t improving, if anything the cloud was getting lower. By the time we reached London Southend the view forward could be described politely as merky. Not wanting to distract air traffic there more then was needed (four Cessna’s in approx. quarter mile formation, radioing for zone transits etc. could become really tiresome), the radio calls had become pretty brief. Golf Golf Sierra, will be doing same as the other Cessna’s in formation. Not exactly standard phraseology, but it did mean us and ATC didn’t need a massive back-n-forth conversational set piece. They could simply acknowledge us, air time is a precious thing – as you’ll see later! 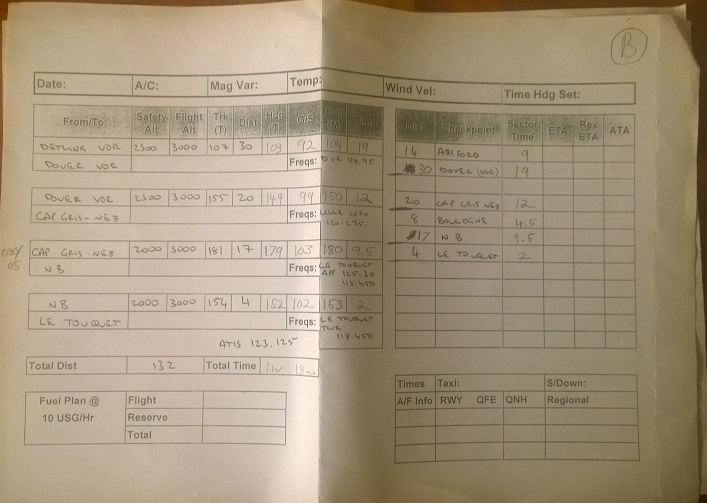 We were now tracking the Detling VOR/DME, not strictly necessary, we were in formation. However, I wanted to play (get more experience) with the toys in G-MEGS and if we lost the plane ahead in the weather, we’d have a fall back all ready to go……..if you’re learning to fly, the best advice anyone can give you is to do as much prep work ahead of when it’s required as possible: At 100+ knots per hour (115 MPH), you’re covering 2 miles a minute and time is not on your side for suddenly faffing with radios, maps and pens when plan A goes wrong. Approaching the overhead of the VOR I was starting to be convinced the channel crossing was a lost cause. The cloud base was getting worse, the visibility was getting worse. Romeo Charlie in front of us was weaving to stay clear of clouds and a few times we’d have to speed up to ensure they didn’t disappear ‘around’ a cloud and be gone. Decision Time : Cross the Channel? 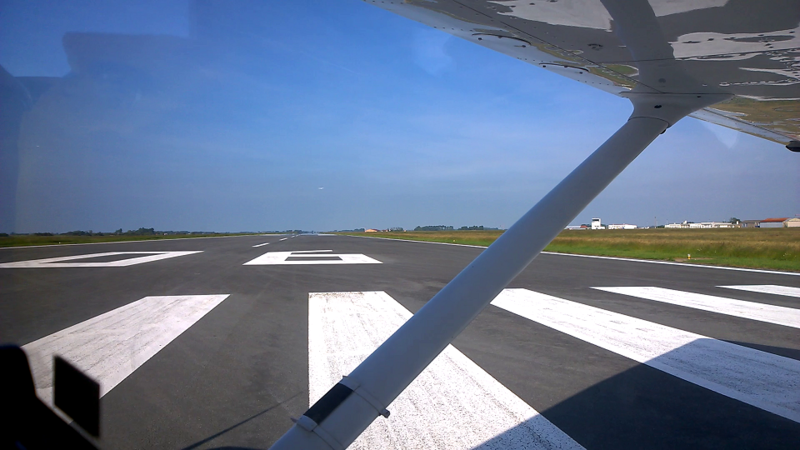 Approaching Dover, it was rapidly approaching the point where we’d have to make a decision to go for it, or abort and switch to an alternate airfield – probably Lydd at this stage. 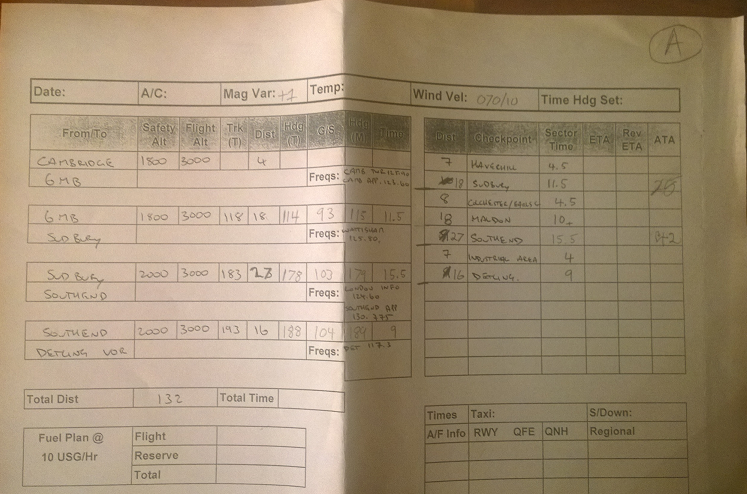 London Information gave us Le Touquet and Calais weather reports. Forget going to Le Touquet, it was in cloud cover. However, Calais, one of our pre-flight planned alternates was looking like a possible winner – if we could just get over the channel. 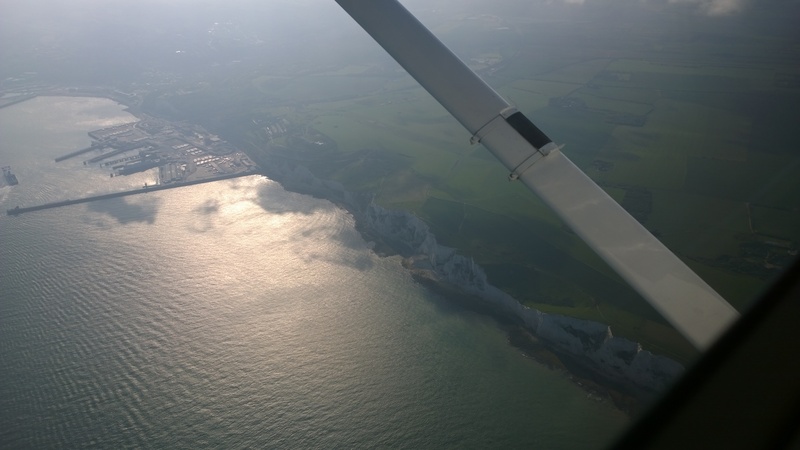 We pressed on, at 1,500ft we edged over the cliffs of Dover….any second the lead plane could call it all off. Every second I found myself hoping for another second over the water, a second closer to the other side of the channel. Not for fear the engine might pack up, but that the closer we got to the other side, the more likely the decision to divert would never come. Cessna formation be aware: Mechasmit followed by a Spitfire operating in your area. How cool was that, we’re off the coast of Dover and we’re getting our own Battle of Britain re-enactment! Unfortunately the weather had us concentrating to much on what was ahead to be enjoying what had just whizzed passed. 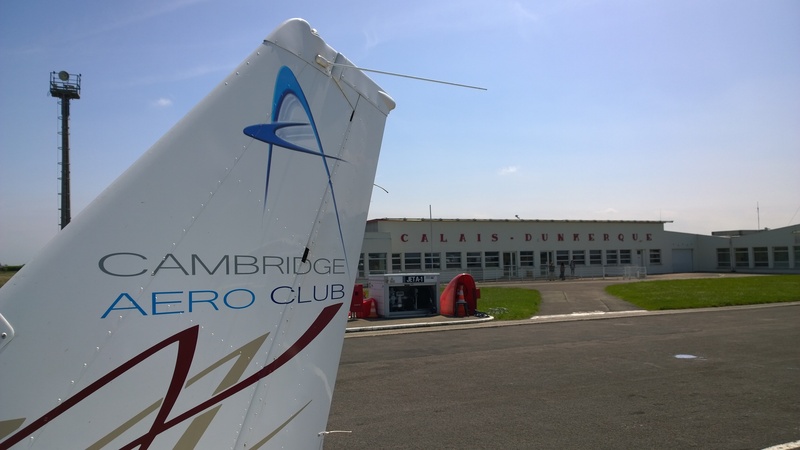 Using a Glider radio frequency we collectively decided Le Touquet wasn’t worth it and to divert to Calais – I really didn’t mind, I’d be happy anywhere on the other side of the channel. 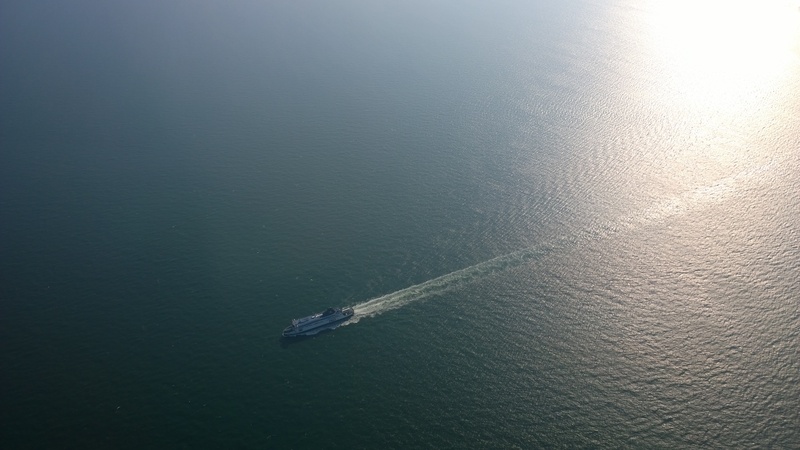 Then, as if out of nowhere, half way across the channel – it all cleared up. French Controllers & British Pilots that won’t shut up! The Language of Air Traffic Control world wide is English, however, there’s someone talking to you in English and then there’s someone who’s passed an exam in it, but would rather not be using it given half a chance. Having thanked London Information for putting up with our little formation, I found myself for the first time ever, now talking to the latter. Still, friendly enough and they gave us no hassle at all. I’m not entirely sure what I was expecting, but what I found far exceeded my expectations and any worries I’d had about what ATC would be like on the other side of the water, quickly evaporated. The lead plane was about 2 miles ahead, with number 2 about 0.5-1 mile ahead of us. The trick now was to fly the handful of miles north up the coast of France, close enough to stay in formation, but getting enough distance to the plane in front that once into the airport circuit, they’d have time to land and vacate, such that we could be cleared to land behind them without going around. As the lead plane elected for a right base join and got granted their wish from Calais ATC, we all followed. My only problem was that plane 2 (Romeo Charlie), seemed to leave it incredibly late to turn. Perhaps they were trying to get distance from the lead plane, the only other theory I have is they hadn’t seen the runway, but I find that harder to believe. Whatever, they seemed to turn late, which left us trying to slow it right down, turning beyond 90 degrees and trying to extend the base leg while flying it. Couldn’t leave it much more though or we’d never get back on the centre line, that’d have to be enough, now descending and flying a typical 70 knot descent on final approach. Thankfully Romeo Charlie’s pilot did a great job landing it early and vacating, we were at about 500ft with about 2,000ft to run. 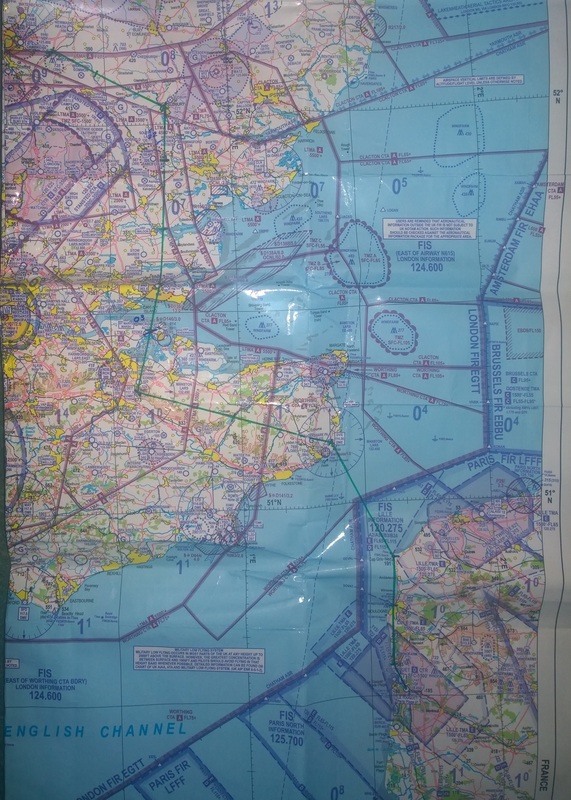 Calais Approach, Golf Blah Blah Blah, over the channel on a QNH of 1234 and just wondering if I could get a weather update from you, seem quite cloudy where I am, yada, yada, yada………righto, roger that…….Sunny you say, and could I also request….. Golf Golf Sierra, Final to land runway Zero Six. Golf Golf Sierra, cleared to land runway Zero Six, surface wind….. Pheeeew!!! 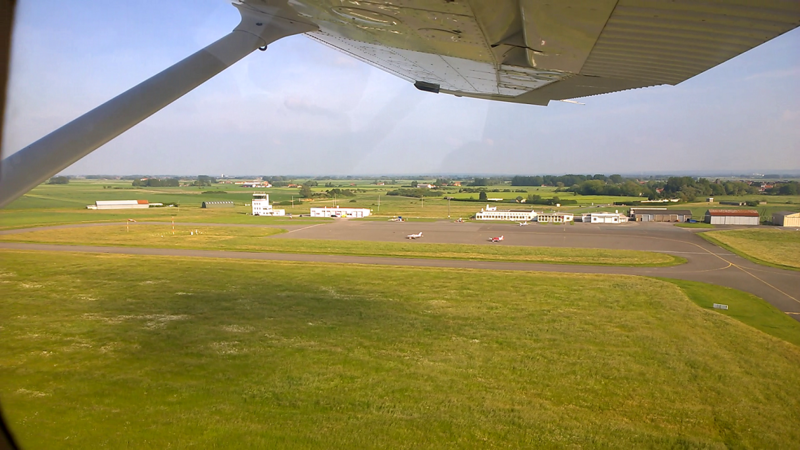 with very little height to spare, I could land the plane – another 100ft or so and it would have been a go-around (and I had no idea of the circuit at Calais). All the effort to keep height and get clearance to land meant I was now higher then I’d have liked, but the landing was still looking good. Lined up with the center, the stall warner went off as I pulled back on the yoke, 20ft above the runway, and then we touched down. Excellent, it wasn’t the finest landing I’ve ever done, but for a first time at this airport I’d take it any day of the week…….but I’d used about 100ft more runway then Romeo Charlie so a pretty sharpish attempt to get MEGS stopped followed, I didn’t want to be the cause of Whiskey Kilo going around!! All the throttle off, brakes on as soon as it was safe to apply them, and just in time for the taxi way exit, we were slow enough to turn right and vacate the runway. Sunshine in Calais: When in France do as the French do – time for some lunch! Why do we need to see your passports? We have 4 planes on our runway, we’re pretty sure you’re coming back! Three taxi’s later, all twelve of us found the best looking restaurant (possibly the first we saw), who layed a table for us outside in the sunshine and we set about having a really nice three course lunch. What more could you ask for, 2 hours ago I was in overcast Cambridge, now I was having lunch with friends in 20+ degree C, Calais. Go learn to fly, this is as cool as it gets! From a money perspective everyone payed for something, I’d got my landing in Calais done so was happy to pay for the landing fee (All 10 Euros of it!!! What a steal! ), lunch was put on an instructors card and we all paid him back in British pounds in England. Someone else bought the 30 euro taxi out into central Calais, I paid for a taxi back to the airport – it all worked out there-or-there-abouts, I think everyone was happy on this front. Food for thought: We’d taken instructors in our plane, but if everyone on-board had ‘bought a seat’, with 3 in each plane, the whole return flight would have cost ~£195 per person, return. A fully flexible Eurostar ticket would cost £250!! 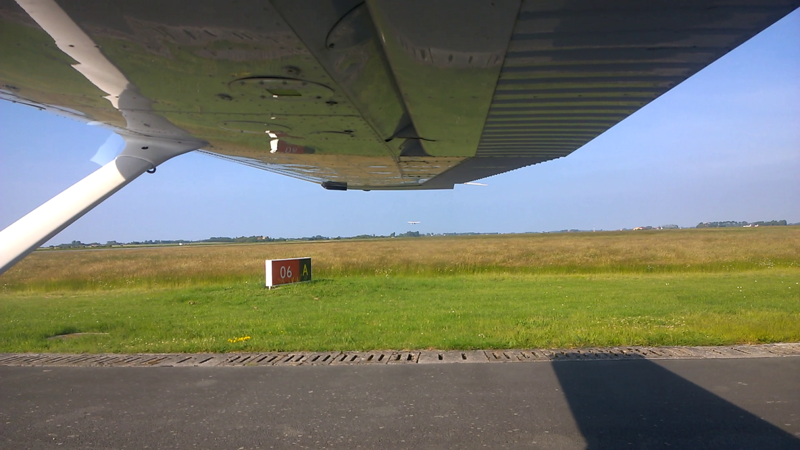 Holding – Ready for Departure. All good things must come to an end and the hours spent debating the weather at the start had eaten into our little trips leisure time – but you know what, it didn’t matter. I’d flown a plane from England to Calais, enjoyed a French three course lunch with some great people in the sunshine and chatted about aeroplanes………as days out go, this is almost as good as it gets. With some great organization from our lead planes instructor, taxi’s arrived to take us back to the airport. Customs was about as effortless as walking through an airport front door and nobody batted an eyelid when in close succession four Cessna 172’s started their engines on the apron. 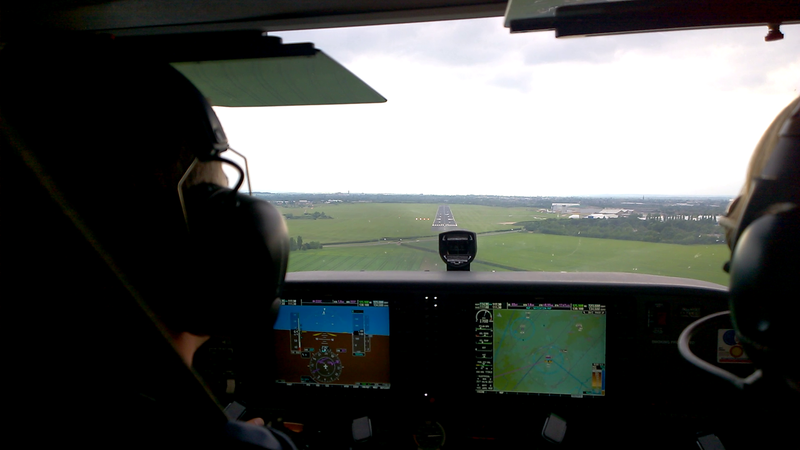 All that was left to do was for our student pilot to make his first take off from a non-Cambridge runway. Some people have all the luck, his first take off from a non-home airfield, wasn’t even in the same country as his home airfield!! Still he did a pretty good job of it, even if the extra weight of three people in a Cessna did come as a little bit of a surprise in its desire (or lack of) to climb. Calais – Thank you and Goodbye (for now). 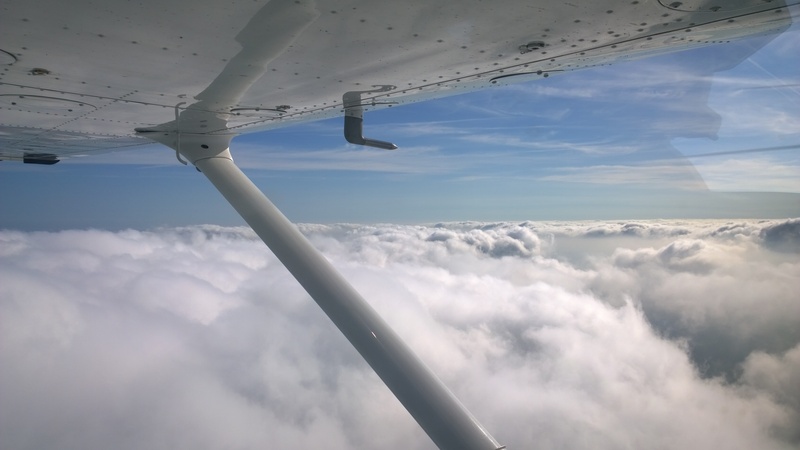 The trip home was a lot of fun, even from the back seat…….in fact I’ve NEVER been in the back seat of a Cessna 172, in all the years now that I’ve been in them it’s ALWAYS been in the front left. Very strange. I decided I’d use this rare opportunity to entertain myself with “work out where I am using only a map and what I can see below” a good chance to brush up on the “if you were lost and had to work out where you were using only the land features you could see, no Nav aids, could you??? ?” I’ll be honest, I really quite enjoyed doing this, a runway here, a railway there, a river going through a town with a round about – ok it should then take us 10 minutes on this heading to be crossing a motorway and if that’s true we’re………. Good views from the back seat. Forget finding the landmarks once we were over the channel again, we followed the lead plane and the lead plane decided to go over the clouds. Although it was an hour and half flight home from Calais, it was a smooth flight, much clearer then our cloud skipping murk avoiding trip out there. I think we got the “who should fly each leg?” question, spot on, while getting out there may have been a headache for a student, I hoped and would like to believe, the pilot now in the front seat was now having a great time flying this trip back. All that remained was to bring it back to Cambridge and land it on a familiar runway. All though we were really running quite late (the original plan to be back by about 4:30pm local) and it was now heading for gone 6pm, we’d phone a head and everything was under control – the airport didn’t close until 8pm and we’d be down no later than 6:30. 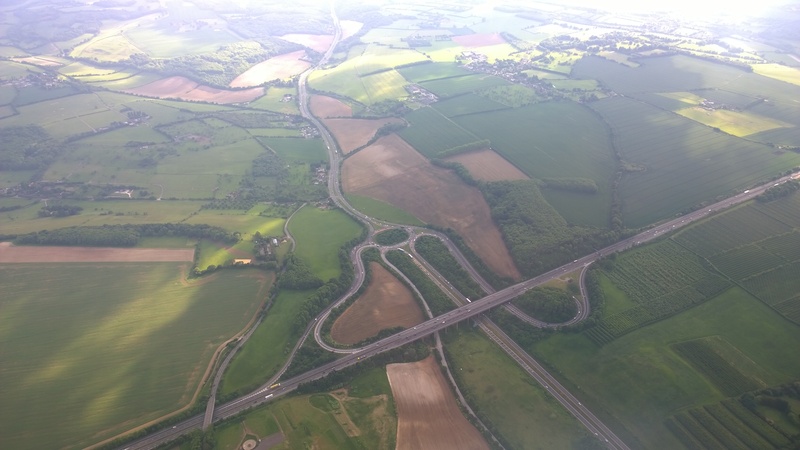 Just time for some more great views of England and a little bit more ‘spot the town using only land marks’ back seat entertainment……..I must try and do this more, it was brilliant practice. 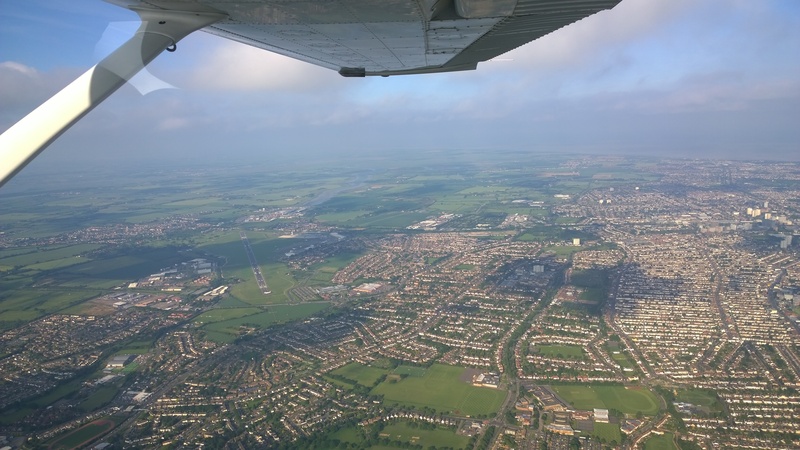 With Cambridge in sight it had been a really good flight, pretty impressive considering our pilot had only recently first solo’d – now he’s just flown a 130 mile cross-channel route! Back on the ground it was a matter of paying up for lunch, filling in the log books for the flight times (I now have a landing at LFAC in my log book!) and returning the life jackets. This entry was posted on Thursday, June 19th, 2014 at 12:23 am by PHC	and is filed under Post PPL. You can follow any responses to this entry through the RSS 2.0 feed. You can leave a response, or trackback from your own site.